This story is suitable for children from 10 to teenage. I had always followed their good advice on this matter. Always there were friends or my brother or father who would go with me. But this occasion was different. I had wanted to keep my journey secret. I was going to visit a girl in the next village, just over the mountain. My parents disapproved of her but I was madly in love. I felt I really needed to see her. I told my mother I was going to stay with my friend Tod over night. He lived only a quarter of a mile away. My mother would think it would not be a problem if I encountered trouble. Tod would come looking for me, whereas in fact I would be three miles away over the ridge, on a rendezvous with this girlfriend, a meeting I had arranged two weeks previously, before the snow had fallen. I put on my skis and warm clothes, a hat, gloves and heavy boots. I would be all right. I set off early shortly after sunrise to make sure that I had plenty of daylight, just in case I encountered trouble. That was my only precaution, and thank heavens, it was the one that saved me, but only just. I made tracks towards Tod’s home for a few hundred yards, and then I branched off into the forest, took my skis off and started to climb to the ridge. It was heavy going; the snow was quite deep. I began to think with irritation and puzzlement about why my mother didn’t approve of Sally. She was such a lovely girl, The problem didn’t seem to be about her, but was something to do with her family. I could never get my mother to explain it to me, she would just get cross and change the subject. A knot of annoyance grew in my stomach as I struggled around boulders three quarters buried in snow. Finally I reached the summit of the ridge. I looked down at the settlement in the distance. Smoke was rising from several of the log cabins. The one my girlfriend lived in was the furthest away, beyond the settlement. I could only just see it in the distance. My heart began to beat faster as I caught sight of her fathers place, distinguished by it’s two chimneys, one at each end of the wooden house. I imagined her face at my arrival, how she would blush and tremble with the pleasure of seeing me. As I caught my breath again after the difficult climb I started to survey my probable route. It was quite straight forward, through the trees, around two rocky outcrops and on down to the village. The snow was about a foot deep and had a crisp layer of ice on the surface, as this side of the ridge faced the sun and the top layer of snow had melted. If I put my skis on I would just glide my way down there and be with her in ten, maybe fifteen minutes. I carefully strapped on my skis. I noticed the leather on one of the buckles was looking a little worn, but it seemed strong enough to me. I pushed off down the hill guiding myself with my poles. Down I went, my heart starting to race again as I imagined Sally, her pretty face all aglow. I rounded the first outcrop of rocks moving faster than was advisable for the terrain, my excitement mounting. I saw a large boulder coming up rapidly towards me. Quickly I wrenched my foot around to change the angle of the skis. The leather strap holding my boot on snapped and my ski smashed onto the boulder. I twisted round and was flung in the air. There was a horrible crack just before I took flight and landed on my back in the snow. I felt no pain but was winded and shaken, angry at myself for having sped so fast with a strap which was obviously wearing thin. Regaining my breath I tried to stand up. As soon as I took my weight on my ski-less leg, it buckled beneath me at a strange angle. A sickening pain shot through my lower leg. I realised that I had broken it. The words that issued from my mouth are not fit to be written on paper. I was so angry with myself. I was livid. What to do now? It would be very unlikely indeed that anyone would come by, this being a forested slope some distance away from any track. As I realised of the implications of my dishonesty and stupidity I began to feel a more continuous throbbing pain in my broken, useless leg. I could not crawl, the snow was too deep, and one of my poles had flown high up into a tree and hung hopelessly in the branches clearly in sight, but well out of reach. Then I remembered something. I should have a whistle with me to alert someone. Painfully I searched my pockets. No whistle. What an idiot I was! All I could find was a penknife and a skewer. I always kept it down the side of my ski boot to scrape out mud from the deep treads, as I used them for hiking in the spring and autumn. In despair I half sat and half lay in the snow. I was beginning to get cold. What to do? I had to do something, but what? Shouting would be a waste of energy. As I lay there becoming more and more anxious and despondent about my situation, there came a soft plop, the sound that a lump of snow makes when it falls from a tree. I looked up and noticed that the bare branches of some sort of tree were shedding their accumulated snow. The branches were rough and coarse looking, with pale raised areas. The words, which had been going through my mind, seemed to get more insistent. I stared at the straight, fragile looking branches and twigs, then I remembered the toy whistles I learnt to make with my grandfather. They were made from elder branches, and this was an elder tree! If only I could reach up and break off a length of one of the branches. I had my knife, I could make a whistle. It was a long hard struggle to reach a branch, but finally with the help of my remaining ski pole, I managed to bend one down. I carefully selected a section that would be wide enough to create a suitably loud whistle. The sun was moving across the sky, soon I would be in shadow. I had to move fast and accurately to make my whistle and then attract attention before I froze to death. I tried to remember exactly how it was done. It had been many years ago since I had made an elder whistle. Cutting fast I whittled a mouthpiece and a wedge shaped hole about an inch above it. The twig was full of soft pith, characteristic of elder. How could I clean it out to allow the air to flow through it? My knife was too broad. I looked up at the sun anxiously noting its progress behind the peaks. I had only about half an hour of warmth left. The shafts of light spiking behind the branches of the trees reminded me of the long pointed skewer I had in my boot. I dug out the pith frantically and blew. And blew and blew. At first I didn’t think about sending a message, just a noise. Then I remembered about the S.O.S. that my father had told me about. I turned the Morse code into blasts on my whistle, three short, three long and three short. Again and again I repeated it. I had started to shiver violently. It was all I could do to hold the whistle in my mouth. The sun had disappeared, I started to feel very tired. ‘Mustn’t go to sleep,’ I said to myself, ‘Must keep whistling.’ In my half dreaming state I thought I heard a dog barking. I blew my whistle just in case. Yes, there was a dog. I blew again, S.O.S, S.O.S. Then I remember nothing more. I woke up in a hospital bed, my mother holding my hand, looking anxiously over me. My girlfriend and her mother were there too. Hazily I recalled what had happened. ‘I’m sorry Mum, ‘ I said sheepishly. Sally stepped forward to squeeze my hand. I wrote today’s story for the first years at my College (Special Needs Dept.) Lack of respect is a common problem. The story is also suitable for 10-11 year olds. Thomas was sixteen. Everyone thought his name was Tom, and that is what he preferred to be called. ‘Thomas’ seemed a bit serious, ‘Thomas’ meant there was trouble ahead. Tom’s gran looked after him. His mum had left when he was very young and his gran had taken on the role of being ‘mum’. Grandad was there too. Tom thought he was great. He showed Tom how to use a saw, how to hammer nails and to make things out of wood. Tom kept ferrets. He had no brothers or sisters but he had a whole family of ferrets instead. He had started off with a female, Jess, he called her. She was not much bigger than a rat when she arrived. Grandad brought her home. A friend at work had given him the young ferret for Tom. They put her in a cat’s carrying box and went out to the shed to see what they could use to make a cage for her. Tom had helped his grandad to make things out of wood, but he had never actually made anything by himself. “You can make the cage Tom,” said his Grandad. That was the great thing about grandad – he always planned ahead. He always took the trouble to work things out beforehand. Tom sort of knew that somewhere in the shed would be all the bits and pieces they needed. Grandad would have seen to that already. He must have known about the ferret having babies for several weeks. He liked to give other people nice surprises, but not problems. The nice surprise was for Tom. The careful planning was for him. “Right lad, here we go. Two metres of four by two…” and so the list started. Tom picked up all the bits as his grandad listed them. He could see he would have to do some sawing and measuring, but he knew he could do it with his grandad’s help. That had been three years ago, now Tom had a row of cages in the garage. He had made them all. Each cage was home to one or two ferrets and each cage was better than the last. Grandad had brought him a ‘jack’ ferret on his fourteenth birthday and over time Jess and Joss, as the male was called, had produced several young. Tom loved his ferrets more than anything. He would take them to country fairs in the summer. Grandad would drive and Grandma always sent them off with a good picnic. 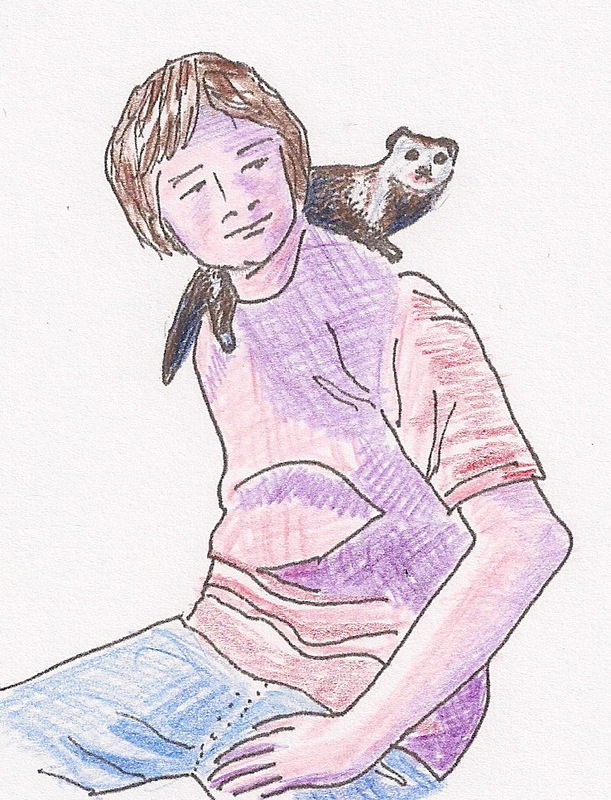 That was Tom’s favourite time of year – summer holidays – ferret racing. Tom started college just after he was 16. He had never been very interested in reading or writing. He was a bit worried about how he would get on. He had decided to study farming as that seemed to be the best subject for him. The students were a mixed bunch. Some of them were very keen on their subject, but a lot of them didn’t seem to care what they did. They were often noisy and rude to each other. They jostled and pushed and generally tried to see if they could make someone else feel small so that they could feel big. Tom thought it was a very strange way to behave. It was not how he had been brought up. He had been brought up to listen to what other people had to say, to pay attention, not to interrupt and to show respect for other people. During a farming lesson, the second one of the term, Tom and his group were in the calf sheds. They were stroking the calves and getting to know them. One of the calves was standing in a corner by himself. The others were skipping around and jostling each other rather like the students at break time. 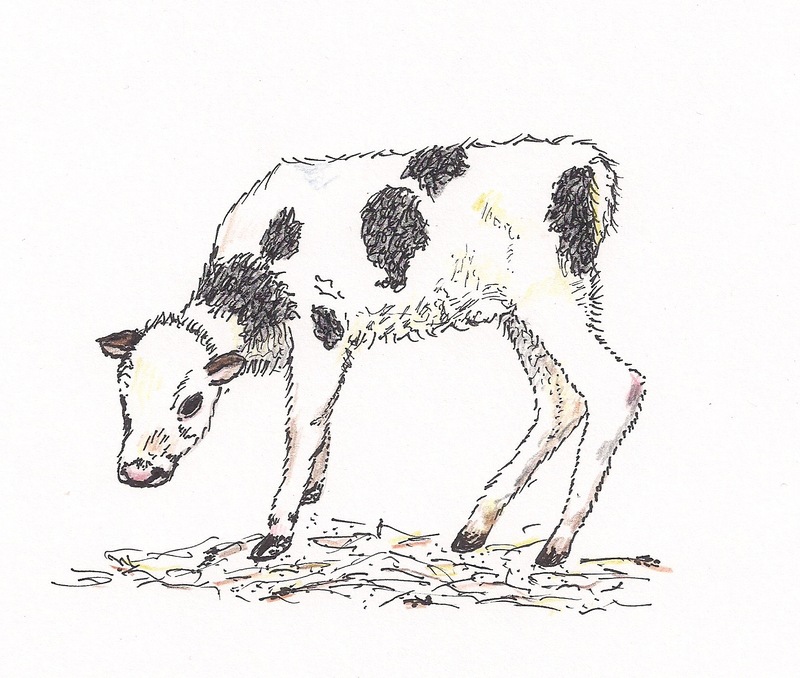 Tom walked quietly over to the lonely calf. Its ears were hanging down and its eyes were half closed. It had a dirty wet backside. Tom stroked its head gently. “What’s the matter with you?” he asked it quietly. Tom went back to the group and the teacher. He said he thought there was a poorly calf in the pen and that it should be separated from the others. “Yeah, what do you know about it, you a farmer or summat?” said a large loutish boy. “Let’s all go over and have a look at the calf,” said the teacher. The calf cowered in a corner. The teacher asked the large boy what he could see. “Looks like a sheep to me, ha ha ha!” he shouted. Some of the others laughed. The teacher turned to another boy. “Mike, your dad’s a farmer, what do you think?” asked the teacher. “Yeah, yeah, clever clogs!” said the large lad. Mike walked beside Tom as they made their way back to College. “You keep animals then?” Mike asked. Damian over heard the conversation. “We lost a puppy last week. One day it was runnin’ around, two days later, dead! My mum was some upset,” he said. “Didn’t it look sick or anything?” asked Tom. “But now you’ve got no dog,” said Tom. Damian looked sad. “No. I had it for my birthday. £350 it cost. It was a great little dog.” He shuffled away. Mike and Tom looked at each other. Neither of them was surprised that Damian’s family had lost a puppy. People who don’t respect people are unlikely to respect animals. Mike shrugged his shoulders and the two boys walked back quietly, lost in their own thoughts. In the first part of the story who do you think Tom had great respect for? Why? How did Tom’s grandad show that he respected people? Did Tom respect his own animals? How do you know? What do you think about making others feel bad so that you feel good? What is another word for that kind of behaviour? Do you think the teacher showed respect for all of his students? Does Damian’s behaviour make you want to respect him? Do you think he is looking for respect in any way? Did he and his dad respect the life of their puppy or did they just think about saving £30, although they had already spent £350. 8. Does the story remind you of anything in your life? In my village in Bangladesh we live very close to the sea. We live in fear of tidal waves, hurricanes, tornadoes and even extra high tides. If the people in my village could have found somewhere else to live, they would have. But most people are too poor to move away, so they stay and pray that the sea will not take them before their time. For me it was quite exciting to pack up all our important things. We did not have very much, but my mother made sure we took our little cooking stove and a large bag of rice along with clothing and bedding and tools for working in the fields. We also took our oil lamp trying very hard not to break the glass. I wrapped my blanket carefully around it to make sure it was safe. The wind blew and the rain fell and we trudged along the road as soon as it was light enough to see. My father said we must walk at least eight miles to get onto higher ground before the next high tide. This was going to be difficult but father thought that even if we didn’t manage the eight miles at least we would be further inland. Maybe the land would soak up the sea behind us, so that it would not reach us, even if we were still on the low lying ground. After we had been walking about three hours a terrible thing happened. The wheel fell off our cart. People were streaming past us with their children, animals and all their worldly goods. Everybody’s cart was full up to the brim. There was no space for our stuff. Mother began to cry as she looked at her little cooker that she loved so much. Would she have to leave it behind? “With any luck when we return we may find this house again and reclaim what is ours.” She said. We continued our journey with no food and no water but with our lives intact. We reached the higher ground two hours before the next high tide and storm. The land was devastated. Thousands of houses were washed away and hundreds of lives were lost. Those too old or too ill to make the journey were drowned. Our family was still together, wet, homeless but together. After five days the local people who had fed us with bowls of rice said we must return to our homelands. There was no room for us in their villages. The water had subsided, so return we did. It was difficult to recognise the route we had taken. Dead animals lay strewn everywhere and every so often there was a human corpse. I noticed that several of the dead were people who had a leg or a foot missing, they had not been able to walk fast or far enough. Father found an old wheel abandoned in the road and was hoping to be able to fix it on to the cart, should we ever find our cart again. My mother suddenly became excited as she saw in the distance the sign near the brick house where our belongings had been left. There lay some beautiful pots in the mud. 7. What was the old man’s attitude who owned the house? A story about life in Siberia and lack of freedom. Northern Russia is known as Siberia. You wouldn’t think many people would choose to live there. I did not choose; I was born in Siberia. I grew up there. I learnt to appreciate the ice and snow, the long dark winters and the warm wet summers when the day stretched into night, so that people did not know when to go to bed or when to rise. I lived with my parents in a concrete block building we called our home. My father used to track and record the movement of animals up in the Arctic Circle for the government. He loved to see the reindeer herds moving across the plains with the seasons. Mother looked after us three children and worked in the library in our town. It was not much of a place really. There was a central meeting hall, several general stores and a few specialist shops. Many of the people had been sent as a punishment for their free thinking to live and work in our town. They were carefully watched by the police who would imprison them if they transgressed the rules. There were not many rules, only two in fact. No anti- communist talk and no leaving the town. It would have been difficult to leave other than on the train as our town was completely isolated. We were surrounded on all sides by hundreds of miles of freezing wastes or the sea. The train arrived once or twice a week bringing supplies and a small number of visitors. The departing trains were always very carefully searched for stowaways before they were allowed to leave. So our town was like an open prison for many of the population. Amongst the so called criminals who had been banished were many intellectuals. The communist party could not tolerate their questioning presence in Moscow or Leningrad so they were arrested on fake charges and transported up north. My mother as a librarian got to know many of the prisoners, for such they were. Many of them had wives and families at home. Some had to leave nice houses and good jobs in colleges and universities; in fact many of those who visited the library were professors, doctors and lawyers. Of course the library books were carefully scrutinised for anti communist ideology before they were accepted for general use. Any suspect material was either used to fuel the central boiler or placed under lock and key, and lent only to a select few who were considered to be incorruptible. When I was about fourteen years of age my parents decided they would like to take a journey to the south to visit some of my mother’s relatives. Mother said she needed a change from the dampness and the midges which plagued us in the summer months. My parents had to plan this holiday a long time in advance. They had to save as much money as possible, and my brother and I took jobs after school to help to raise the money. I had spoken about different parts of the USSR with some of the prisoners. I was very excited. I loved the sound of the mountains and the lakes. I wanted to taste the fresh fruit and vegetables which they told me were incomparable to the salted pickled, bottled and jammed products that we ate every day. My brother was fascinated by television – We had never seen one, only films in the meeting hall about once a month. Usually they were very boring political films about how well things were going in our ‘wonderful country’, but occasionally we would be shown adventure stories, cowboy films, or even romance. These films had subtitles as they were inevitably foreign. My brother adored them. He loved to act and he saw himself on a stage, his name in lights, or better still on the television, a great Russian actor of the new generation. My job after school involved sweeping the meeting hall and putting all the chairs back in position for the next day’s events. It took me one and a half hours to do or two if I did not concentrate on my work. Sometimes I would stand on the dais, a good meter above the level of the floor, and I would make political speeches, waving my arms around. I would talk at length about what I thought Russia could be like if everyone was free to say and think what they pleased. I would make sure everyone had left before I started on these little personal expressions of my ideological views. The old janitor didn’t care what I said; in fact I think he was a sympathiser. He used to sit at the back waiting to lock up, as it was warmer in the hall than in either of our houses, neither of us would be in a hurry to get home and my oratory would amuse him. He told me one day that I had great potential as a political leader, but that I must be extremely careful to whom I expressed my views. He was convinced that communism such as it was in the USSR could not last and that young people with new ideas had to supersede the old guard. He warned me that if I was not careful I could become a prisoner in my own town too, but since I was only fourteen I had several years of comparative freedom before my opinions mattered to any one. My brother would earn his money by cleaning the bar at the other end of the same street as the meeting hall. There would be chairs to move and cigarette ends to sweep, spilled vodka and usually a broken glass or two to clear. He said that his clientele were more artistic than mine and his conversations with the barmen were never about politics, but about the latest film or magazine he had seen. So both my brother and I had great ambitions to succeed in our different fields of interest, and this trip was going to give us a taste of the world that we wished to enter, many miles away from the cold dark influence of Siberia. Neither of our parents had any useful connections or power. I did wonder how I was going to make my breakthrough into the world of politics. My brother and I spent many a long hour discussing how we thought we could meet the right people who would help us achieve our goals. One day my mother invited one of the dissident professors home to share a meal with us. This was an infrequent occurrence in our house, but when it did happen my brother and I made sure we did not miss a moment of it. Some of these people were well worth listening to. “Ah, I have two sons just about your age, how I miss them. I keep thinking of things they need to know to succeed in life, and I can only write to them. I can’t be sure that my letters are not censored. Looking back, I see that what the old man told us turned out to be prophetic; much has changed in the intervening years, much for the better, but some for the worse. I can only hope that my grand children have a more comfortable and secure life than my family had in the ‘50s.